Καλούπι σικλικόνης για να δημιουργήσετε το γυναικείο κορμό. Quickly create your figure's torso with the Body Mould from Sweet Revolutions by Domy. 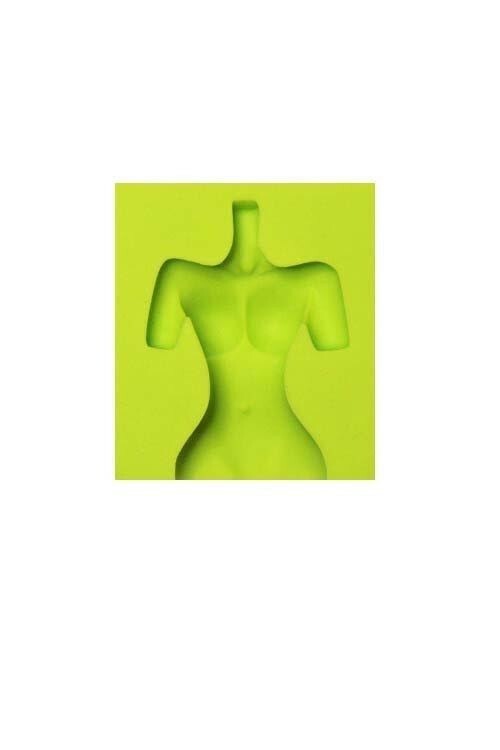 The mould design features a lady’s torso that can be used to complete contemporary models and novelty figures. The mould is made from high quality food grade silicone and specifically designed to aid in the making of figures. The Body mould is recommend for use in conjunction with the Face and Arms and Legs mould from Sweet Revolutions to create the perfect model. The mould can be used with a wide range of materials including sugarpaste/fondant, florist paste, modelling paste, modelling chocolate and marzipan. 1. Colour the modelling paste to the desired skin tone. 2. Press the paste firmly into the mould, making sure all the excess paste is pushed in to ensure clean edges. 3. Leave the filled mould to rest for 10 minutes. 4. When the paste is dry, unmould by gently pulling the sides of the mould apart and pushing up at the back of the mould.